Continuing our trek clockwise around the World Showcase at the Epcot Food & Wine Festival (we started at Terra), we come to the lovely Caribbean booth. 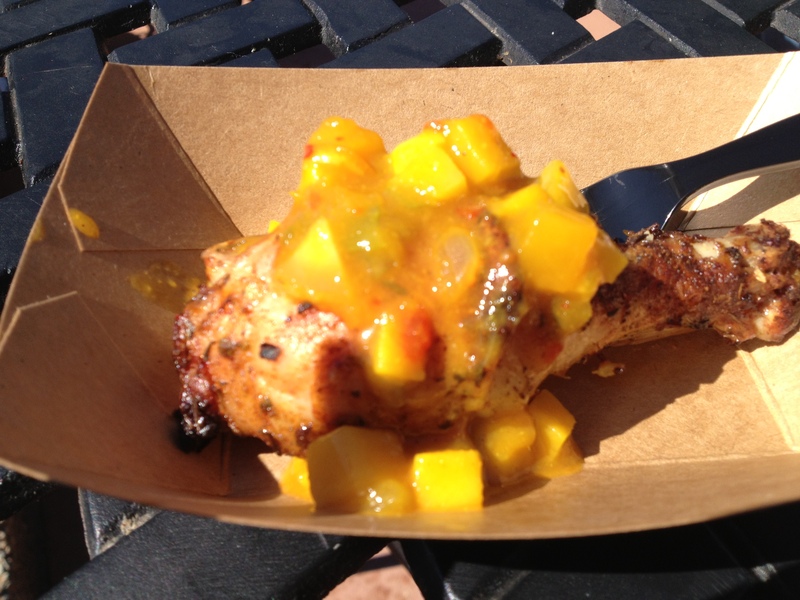 The offerings here were Ropa Vieja with Cilantro Rice, and Jerk Spiced Chicken Drumstick with Mango Chutney. Because I adore jerk rub (tee hee) I decided to try the chicken. Drink options were from Bacardi – a Torched Cherry Frozen Cherry Limeade and Frozen Dragon Berry Colada. I didn’t have either of the drinks – had to pace myself. Next stop on our trip around the World Showcase was Argentina. Here, the choices were Beef Empanada or Grilled Beef Skewer with Chimichurri Sauce and Boniato Puree. The wine options were from Terrazas Reserva – a Torrontes, Chardonnay, Malbec, and Cabernet Sauvignon. I opted for the Malbec. I saw the empanada, and it didn’t look great. I’m super picky about empanadas, and the pastry looked too thick and doughy. The person standing next to me told me it was like a calzone. So I ordered the beef skewer. This was like a perfect mini-meal. The beef was tender, flavorful, and medium rare. 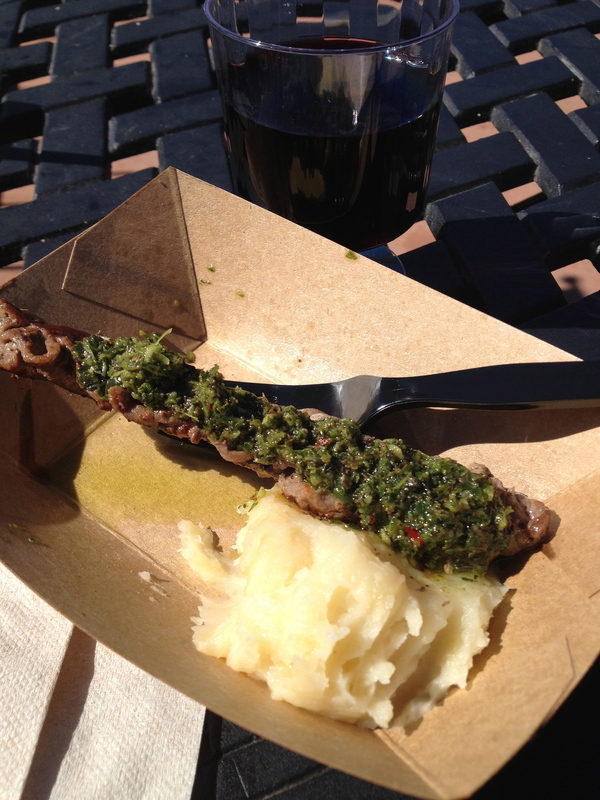 The chimichurri was bright and herbaceous, garlicky, with just enough tangy-ness (if you’re not familiar with chimichurri sauce, here is an explanation) And the skewer was on pureed boniato, which basically tasted just like good mashed potatoes. I wasn’t familiar with boniato, so looked it up. It’s what’s sometimes called sweet potato in the caribbean (not the orange sweet potato I was familiar with). It’s got some sweetness, but really just tasted like mashed potatoes. And apparently it’s available year round in Florida, so hopefully it didn’t have to travel far to make it to Epcot. Oh, and I’ve never met a Malbec I didn’t like. Did you make it to the Caribbean or Argentina booths? I saw many people who really enjoyed the chicken, and I know I like my food more spicy than most. What did you think? Wish I’d tried that ropa vieja!